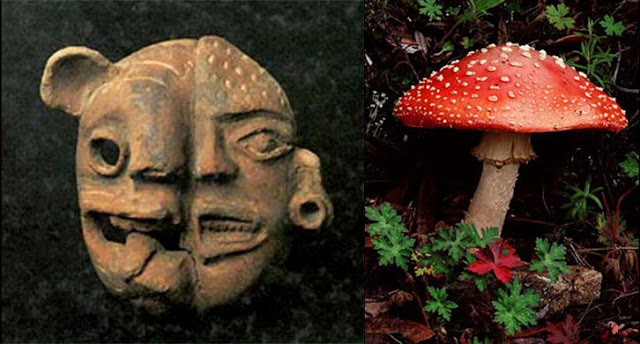 Above, on the left, is the Amanita muscaria mushroom, and on the right a Maya figurine (300-900 C.E.) photographed by Justin Kerr (K 656a). The figurine wears a headdress inspired by the Amanita muscaria mushroom. Its contorted face depicts the "Olmec snarl", a common motif in Olmec art which I believe represents the mushroom's effect of jaguar transformation and the soul's mythical underworld journey. The figurine holds in its hands a concave mirror. Mirrors were used by shamans to see into the past and future and communicate with ancestors and gods. I believe that in many, if not most cases, this communication was conducted under the influence of mushrooms. According to Hugh Thomas (1993 p.14) "The mushrooms of the Mexica (Aztecs), the most important of these plants, came from the pine-covered slopes of the mountains surrounding the valley." Above left is an Amanita muscaria mushroom commonly found in the pine-covered slopes of highland Guatemala. Much of the mushroom imagery I discovered (Hidden In Plain Sight) was associated with an artistic concept I refer to as jaguar transformation. 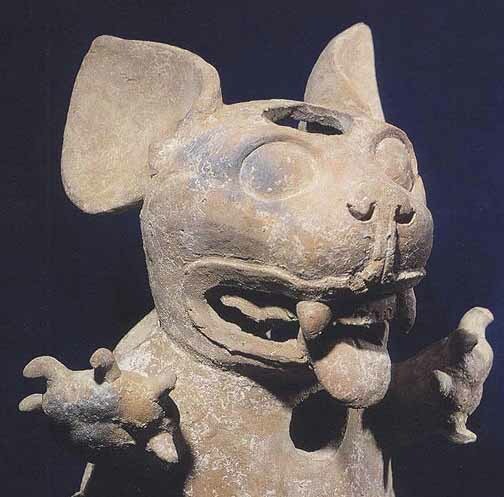 Under the influence of the hallucinogen, the "bemushroomed" acquires feline fangs and often other attributes of the jaguar, emulating the Sun God in the Underworld. This esoteric association of mushrooms and jaguar transformation was first noted by Peter Furst, together with the fact that a dictionary of the Cakchiquel Maya language compiled circa1699 lists a mushroom called "jaguar ear" (1976:78, 80) . According to the late ethno-mycologist Robert Gordon Wasson, the term shaman is not native to Mesoamerica or even to the New World but derives from the languages of Siberia. Siberian shamanism incorporates ecstatic trances brought on by a ritual of dance and the inducement of hallucinations, most commonly through the consumption of some hallucinogenic substance. The intention was to open communication directly with the spirit world, often through a form of animal transformation. The worship of animal spirit companions and the concept of human-animal transformation is so ancient, that the origins of these beliefs appear to predate the development of agriculture. Since these beliefs are also present throughout North and South America that they may very well have been brought there by the first hunters and gatherers to reach the New World. We find the first evidences of these shamanistic rituals in Mesoamerica in the art of the ancient Olmecs along with the development of agriculture, food production, and settled village life. The photograph above is of an Olmec whistle owned by Higinio Gonzalez of Puebla, Mexico. It most likely comes from the San Lorenzo phase of Olmec culture, 1200-400 B.C.E. These infantile baby-faced figurines, many of which depict the symbolism of a snarling jaguar, are a distinctive feature in Olmec art. 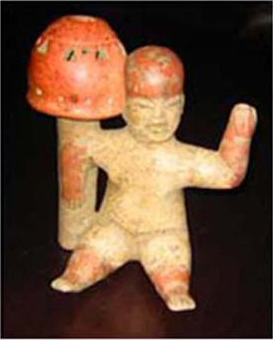 This figure appears to represent an Olmec baby wearing an Amanita mushroom cap and holding a gigantic Amanita mushroom. 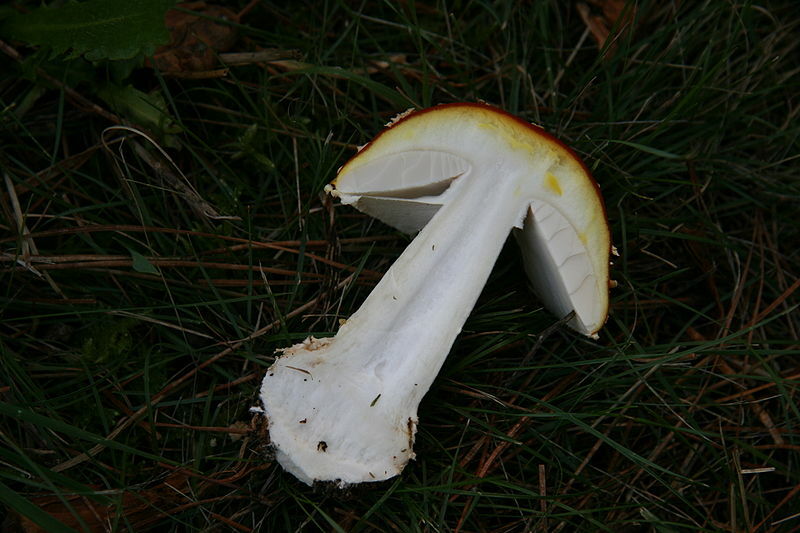 According to ethno-mycologist Gastón Guzmán, one of the effects of the Amanita muscaria mushroom experience is to see objects as gigantic in size. (Guzman, 2010). Many of the images with encoded mushrooms involved rituals of self-sacrifice and decapitation in the Underworld, alluding to the sun's nightly death and subsequent resurrection from the Underworld by a pair of deities associated with the planet Venus as both the Morning Star and Evening star. This dualistic aspect of Venus is why Venus was venerated as both a God of Life and Death. It was said that (The Title of the Lords of Totonicapan, 1953 third printing 1974, p.184), they [the Quiche] gave thanks to the sun and moon and stars, but particularly to the star that proclaims the day, the day-bringer, referring to Venus as the Morning star. The ceramic Precolumbian mask above depicts the transformation of a human into a “were-jaguar,” a half-human, half-jaguar deity first described and named in 1955 by archaeologist Matthew W. Stirling. The were-jaguar appears in the art of the ancient Olmecs as early as 1500 B.C. An Amanita muscaria mushroom is encoded into the head and nose of the human side, while the left half of the mask depicts the effect of the Amanita mushroom thus resulting in a were-jaguar transformation. The were-jaguar eventually came to be worshiped and venerated throughout Central and South America. 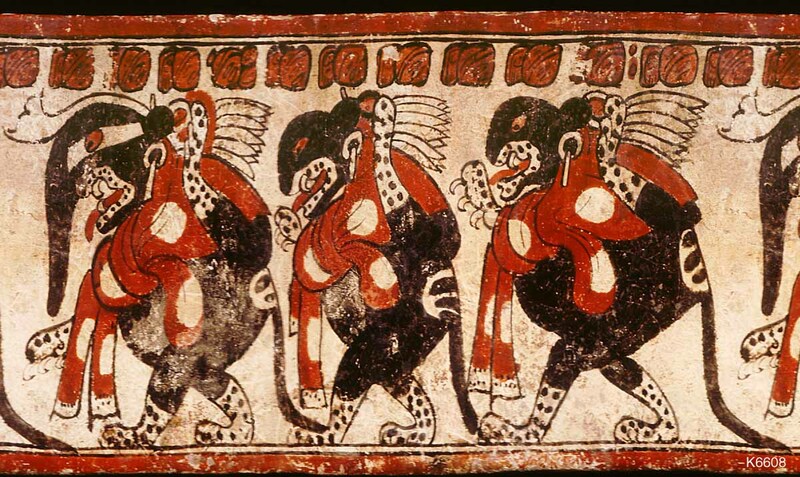 Maya vase K6608 from the Justin Kerr Data Base of Maya vase paintings, depicts three underworld jaguars which may symbolize the three hearth stones of creation, a "trinity of gods" in Maya religion known at the archaeological site of Palenque as GI, GII, GIII. The underworld jaguars all wear mushroom shaped ear plugs, and wear sacrificial scarves, symbolic of underworld decapitation. The scarves metaphorically bear the colors and spots of the Amanita muscaria mushroom. Above is a Classic period 450-650 A.D. (Remujadas, Veracruz, Mexico) jaguar effigy incensario with what looks to me like an encoded half-sliced Amanita mushroom for a nose. (Photo of Jaguar from Stendahl Galleries Fine Precolumbian Art). Maya Vase K7289 from the Justin Kerr Data Base depicts a ruler or priest involved in a mushroom ritual of underworld jaguar transformation. The ruler or priest wears a mushroom inspired ceremonial cloak and the headdress of the underworld jaguar. The ruler is depicted holding a ceremonial bar from which emerges the divine vision serpent known to scholars as the Och Chan. A deity wearing the ears of a deer and blowing upon a conch shell emerges from the jaws of the vision serpent. In summary, the mushroom inspired images I have presented to this point, most of which are cleverly encoded by the artist, (Hidden In Plain Sight) are just a few of the many images I found that clearly represent mushrooms and mushroom worship. Mushroom imagery occurred with such frequency and in such indisputably religious context that there can be no doubt as to their importance in the development and practice of indigenous religion. While I may be the first to call attention to this encoded mushroom imagery, these images can be viewed and studied with ease on such internet sites as Justin Kerr's Maya Vase Data Base and F.A.M.S.I. ( Foundation for the Advancement of Mesoamerican Studies, Inc). My research was inspired by a theory first proposed by my father the late Maya archaeologist Stephan F. de Borhegyi, better known as Dr. Stephan Borhegyi, that hallucinogenic mushroom rituals were a central aspect of Maya religion. He based this theory on his identification of a mushroom stone cult that came into existence in the Guatemala Highlands and Pacific coastal area around 1000 B.C. along with a trophy head cult associated with human sacrifice and the Mesoamerican ballgame.